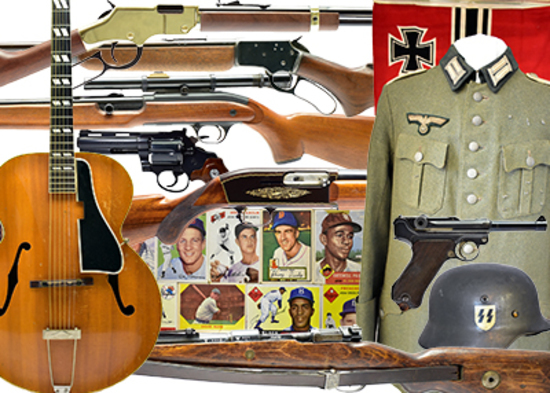 Selling Hundreds Of Firearms, Militaria, Vintage Guitars, Early Baseball Cards, ATV's, Ammo & More. Payment Instructions: Each successful buyer will be emailed a preliminary invoice following the conclusion of the auction. The credit card used to register with will be charged the preliminary invoice amount on Tues, March 19, 2019. A separate shipping charge will be charged to the same credit card once items have been boxed and weighed. Please note that shipping could take a couple weeks and we will not start the shipping process until Weds, March 20, 2019. If you would NOT like us to charge the credit card that you have on file and would like to pay by another means please email us at auction@willsullivanauction.com by Tues, March 19, 2019. All FFL copies can be sent to auction@willsullivanauction.com, please make sure that your FFL includes your name in the email. FEES FOR THIS AUCTION- - 20% Buyers Premium - $15.00 FFL Paperwork Fee ($15 Will Be Added To Each Gun Purchase, This Goes To Our In-House FFL For Processing Each Gun In And Out Of Their Books) This is not a transfer fee. - Shipping Cost - We will try to keep shipping charges as low as possible but each successful buyer will be charged the price of shipping, via UPS or USPS unless otherwise instructed. - $10 handling charge for time and shipping material. Shipping Instructions: ALL GUNS MUST BE SHIPPED DIRECTLY TO AN FFL REGARDLESS OF AGE - FFL copies must be emailed to auction@willsullivanauction.com We will start boxing and weighing items for shipment on Weds, March 20, 2019. Shipping could take a couple weeks, so please be patient. If a buyer would like to put a rush on shipping, we will try to accommodate if we can. Once we have a copy of an FFL and your items have been boxed and weighed we will charge your credit card a second time with shipping charges. If you would like to pay for shipping with cash, check or and alternate credit card, please email us and let us know by Thursday, March 21. We have describe each item to the best of our knowledge and have taken lots of good pictures of each item but all sales are final, NO returns, NO exceptions. All guns must be shipped to an FFL regardless of age. Illinois Gun Laws Apply. Will Sullivan Auction Co.. terms and conditions. Bidder agrees to be bound by the terms that follow, if bidding online. Bidders are required to register with proper identification prior to bidding and must use the number issued to them when bidding. Online bidders are required to register with Proxibid. Registering through Proxibid requires a valid credit card as a security measure. All items sold as is where is. All announcements made at the auction shall supersede any prior advertising. Any/all Purchasers will be expected to rely upon his/her personal inspection or investigation of the property being offered at the Auction, or that of an approved party to Buyer, and not upon any representation of warranty or condition by the Seller or the Auction Company. Seller or Auction Company will, in NO WAY, be held responsible for any discrepancies, damage or loss of any property of Buyer once the Auctioneer says SOLD. Will Sullivan Auction Co. is providing Internet pre-auction and live bidding as a service to Bidder. Bidder acknowledges and understands that this service may or may not function correctly the day of the auction. Under no circumstances shall Bidder have any kind of claim against Sullivan & Son Auction or anyone else if the Internet service fails to work correctly before or during the live auction. Sullivan & Son Auction will not be responsible for any missed bids from any source. Internet bidders who desire to make certain their bid is acknowledged should use the proxy-bidding feature and leave their maximum bid 24 hours before the auction begins. Sullivan & Son Auction reserves the right to withdraw or re-catalog items in this auction. We have taken lots of photos of each item so that all online bidders can be their own judge on identification, authenticity and condition. We have also described each ite...morem to the best of our knowledge but once again take advantage of all of the photos and be your own judge. Absolutely no returns. There is a 20% Buyers Premium for this auction as well as a $15 per gun paperwork fee and shipping charges. You've been outbid to t****z! to YOU! SN - 5922, Made in Austria by Steyr-Daimler-Puch, numbers matching, Nazi proof stamps throughout, typical "end of the war" design with a few crude components, appears ori...moreginal. You've been outbid to I****r! to YOU! No SN, Walnut stock with receiver overlay, 24" barrel, adjustable elevator rear sight/ ramped dovetail front sight, JC Higgins Rifleman 4X scope, 3/4 tube, original retra...morectable stock sling, very nice condition with a little surface rust on scope, gun is very clean. No SN, Walnut stock with Bakelite trigger guard, 24" barrel, rear dovetail/ ramped dovetail front sight, 3/4 tube, sling rings, nice condition with some light surface rus...moret on barrel. SN - 21670111, Walnut stock with fancy engravings on grips and under forearm, gold trigger, 22" barrel, adjustable elevator rear sight/ ramped dovetail front sight, sling...more rings, full length tube, good condition with some surface wear. No SN, This is an early Mossberg model 42 made for Montgomery Wards, walnut stock with oversized forearm, homemade magazine holder in stock with leather cover, 24" barrel...more, adjustable elevator rear sight/ dovetail beaded blade front sight, original detachable magazine, good condition. SN - 26185735, Blond stock with squirrel design, 22" barrel, adjustable elevator rear sight/ ramped blade front sight, Simmons 3-9X40 scope, full length tube, nice condit...moreion with light surface wear on barrel. SN - GB335336, Walnut stock with Ducks Unlimited engravings, gold receiver, 20" octagon barrel, adjustable rear sight/ dovetail blade front sight with gold bead, full len...moregth tube, new in box. SN - 26007, British proof stamps throughout, converted to 38 Special, double-action, 6-shot, checkered walnut grips, cased hammer and trigger, 6.5" barrel, high blade fro...morent sight, sharp bore, nice condition with light wear, very rare. You've been outbid to h****4! to YOU!